You'll notice I'm posting more photos locally on my blog...I'm moving more of the stories I share on my Facebook Page here so that traffic to my blog can be increased, and that I have my stuff hosted on my blog rather than a Facebook Page that can be taken away if the powers that be so choose. 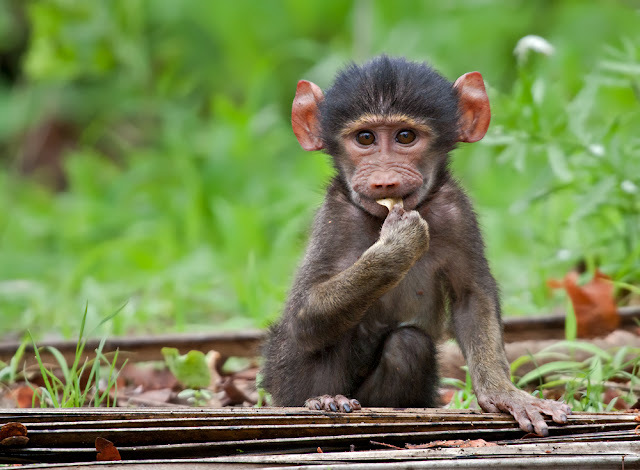 This is a baby Chacma Baboon photographed in the Kruger National Park in South Africa. These little guys are photographic gems and always provide fun, interaction and quirky poses like this. This guy was part of a troop which hangs around the Shingwedzi river close to Shingwedzi rest camp. Their whole area has changed due to the recent floods there, so I'm not sure if the troop has moved on. Overcast, rainy weather evened out the shadows and created a nice exposure with soft light. You always need to be mindful for great poses with primates, especially ones which can seem anthropomorphic. The smaller the subject, the more important the shooting angle also becomes. I was able to get a decent low perspective here, even though I was shooting from my vehicle parked on the road. You may share this image as presented here under the Creative Commons Attribution-NonCommercial-NoDerivs 3.0 licence (CC BY-NC-ND 3.0).